The vast majority of e-Readers feature a closed software ecosystem that prevents users from installing their own apps. Many devices such as the Sony or Nook line of e-Ink readers all run Android, but provide zero flexibility in this regard. A new e-Reader unveiled at the Frankfurt Book Fair seeks to remedy this situation and provide a truly “open” Android experience. The imcoV6L features a six inch e-Ink Pearl HD display screen with a resolution of 1024×758 pixels. It also has a front-lit display, to allow you to read in the dark. Underneath the hood, it is powered by a Rockchip 1 GHZ CPU processor and 256 MB of RAM. There is 4 GB of internal memory and has an SD Card slot to enhance it up to 32 GB. One of the most interesting aspects of this device is external speakers and 3.5mm headphone jack. This will allow you to listen to audiobooks and music right on the device. 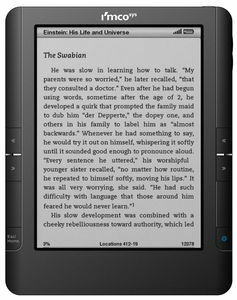 Since it is running Android, you will be able to install apps such as Audible, to buy and listen to them right on your e-reader. Another great feature is the physical page turn buttons working in conjunction with the touchscreen. You can turn the pages by gestures or with the click of a button on the left/right hand side. The most compelling aspect of this new reader is the fact that you can load in your own Android apps. This will allow users to install Kindle, Kobo, Nook, Sony, Aldiko, Moon+ Reader, Marvel Comics for e-reading. It does not just stop there, but you can install Gmail, Dropbox or any other app that you want. Obviously you won’t want to play games on an e-ink screen, but productivity and e-reading apps will be amazing. It is set to retail for $99 euros and is poised to be a European exclusive. In the next few days we will try and get an exclusive first look at this new device and talk to the developers at their booth.